Finished quilt: 75" x 90" or 90" x 105"
This fun quilt uses a variety of 15 Assorted Prints for either size quilt. Choose prints that vary somewhat in value to make your stars really stand out. We used 4 different Background fabrics for added interest. Piece accurate half-square triangles for the frames around the stars using 2" half-square triangle paper (alternate instructions are included if you prefer not to use triangle paper). 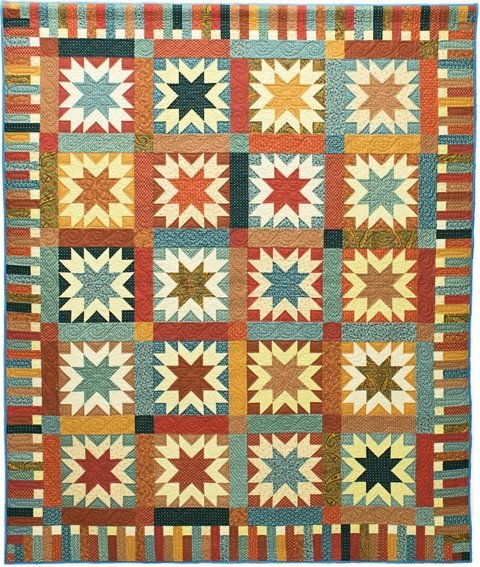 The sawtooth stars are pieced using the 4 and 1 flying geese technique. The piano key border makes an easy finish. Border units are added to the ends of the rows before you join your rows together. Work with a planned selection of prints if you wish. The pattern also includes number of pieces needed to make it easy to cut from your stash.